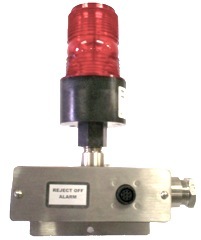 The AIC-110 is the alarm indicator/controller for the ADR-50D style units . It can be set to alarm you, via a strobe light or horn, if the reject count is beyond your limits that you set. It also can be connected to the conveyor system and to shut it down if there is a large amount of rejects. The ROA-150 is designed for the ADR-50D style units. The ROA-150 alerts you when the rejector has been disabled from a unauthorized personnel. The D-1 provides a mechanical method of measuring the relative position of the center of a container lid. As the internal pressure of a container increases, the internal volume of the container increases forcing the lip up. For any specific container, a relationship can be established between the lid position and vacuum or pressure inside the container. 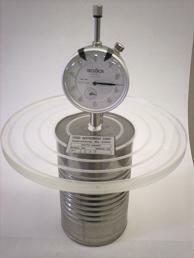 Once this relationship has been established, it is then possible to measure container vacuum or pressure by measuring the lid position of the container. The D-1 Depth Gauge permits you to make the same measurement mechanically as the ADR makes electronically. Thus, the D-1 Depth Gauge can be used to measure internal pressure or vacuum in containers with a non-destructive test, allows verification of ADR operation and permits evaluation of potential ADR applications. The Test Can is made to the same size and dimensions as the can that you are processing. The can is designed to provide a stable reference to aid in the calibration of the ADR-50 on an active line. This rejector rejects up to 2,000 cpm and is inclosed with a stainless steel housing. It comes with a air filter-oiler-regulator that is necessary for internal components. This rejector is basically the same as the HSR-2000 in looks for harsh enviornments but can only handle 800 cpm. It to comes with the air filter-oiler-regulator. The ADR-50C2D allows the customer the ability to upgrade their old 50C to a 50D for a low price. Upgrades come in three types, depending on what you want and what you have. This is the level one upgrade. Your old ADR-50C head assembly (stand alone unit) or head assembly and remote cabinet ( remote unit) will need to be sent in to us for upgrades. We will replace the front panel and boards (amp. assembly) with the 50D micro processor and push button amp. assembly. Some work may need to be done to the Waterproof Enclosure to make it compatible to the 50D. The pan assembly, that is located under the head assembly, will be modified for the 50D to work properly with stationary photo/light eyes. If there is any repairs that need to be done, we will make the repairs as an extra charge. This is the level two upgrade. Your old ADR-50C head assembly (stand alone unit) or head assembly and remote cabinet ( remote unit) will need to be sent in to us for upgrades. We will replace the front panel and boards (amp. assembly) with the 50D micro processor and push button amp. assembly. Some work may need to be done to the Waterproof Enclosure to make it compatible to the 50D. The aluminum housing will be replaced with a stainless steel housing and the aluminum pan assembly will be replaced with a stainless steel pan assembly with stationary photo/light eyes. If there is any repairs that need to be done, we will make the repairs as an extra charge. This is the level three upgrade. Your old ADR-50C head assembly (stand alone unit) or head assembly and remote cabinet ( remote unit) will need to be sent in to us for upgrades. We will replace the front panel and boards (amp. assembly) with the 50D micro processor and push button amp. assembly. Some work may need to be done to the Waterproof Enclosure to make it compatible to the 50D. The aluminum housing will be replaced with a stainless steel housing and the aluminum pan assembly will be replaced with the 50D adjustable pan assembly. If there is any repairs that need to be done, we will make the repairs as an extra charge. These spare parts kits will help your unit to run for a long time. The _ is for the type of unit that you have (ADR-50C, CR, CB, D, DR, DB, DD or DC). If you purchase these kits you save on the cost of the parts if purchased individually. This is the level one spare parts kit. It includes: Boards, Modules, Reference strip, Misc. Parts, Tools & Hardware. It will allow you to continue to run for some time with minimal down time. This is the level two spare parts kit. It includes basically the same parts as the level one but with higher quantities and extra parts. It does come with an extra rejector. This is the level three spare parts kit. This kit comes with everything that level two has, also with higher quantities and a few extra parts. This will keep you in stock ready for what ever happens.